Tasteful taboo-breaking might be the point of much of 1962's The L-Shaped Room, an adaptation of Lynne Reid Banks's novel by Stepford Wives director Bryan Forbes. The main character is a young French woman, pregnant out of wedlock, who is urged by most everyone she meets to get a (then-illegal) abortion. Kicked out by her conservative parents, the woman settles in a London boarding house that has seen better days (maybe before the war?). The house offers a roof to working prostitutes, homosexuals, and -- shudder! -- an unemployed, struggling writer. Naturally, the film's once-edgy subject matter is now quite ordinary, but The L-Shaped Room is an effective little kitchen sink drama that still engrosses viewers thanks to its affection for its characters and (especially) the actors playing them. Writer-director Forbes got his start as an actor himself, which no doubt explains the premium the film seems to place upon performance. 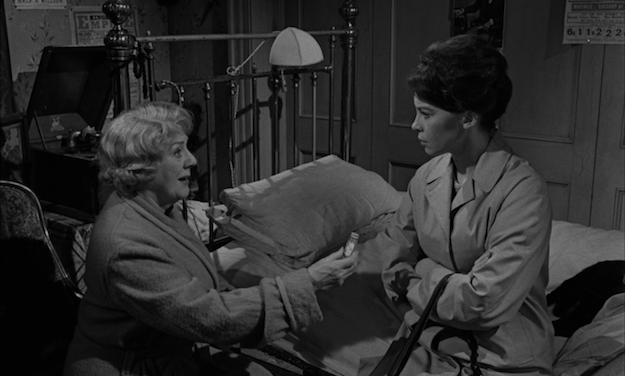 Leslie Caron gives the impression of a wounded doe as single-mom-to-be Jane Fosset. She's no longer the ingenue of Gigi, released a short four years prior, and the unavoidable baggage of her candy-colored musical past can't help but add weight to the relatively grim, black-and-white proceedings. 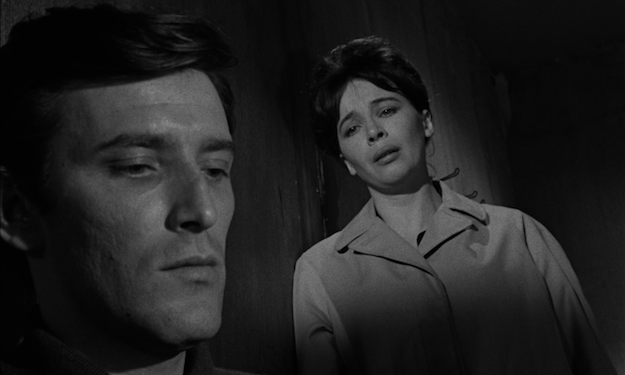 The film doesn't give her much in the way of backstory, apart from an awkward meet-up with the unwitting biological father (Mark Eden), who is too focused on his burgeoning acting career to realize that Jane hates him. Still, Caron tells us all we need to know as she comports herself with self-respect, even as the world flings indignities at her ad nauseam. To Kill a Mockingbird's Brock Peters steals scenes as Jane's Caribbean neighbor Johnny, who is pretty much her roommate: the shabby walls of his cramped living space -- which intrude on Jane's quarters to give it that distinctive "L" shape -- are a clear money-making afterthought by the landlady to transform an existing room into two. 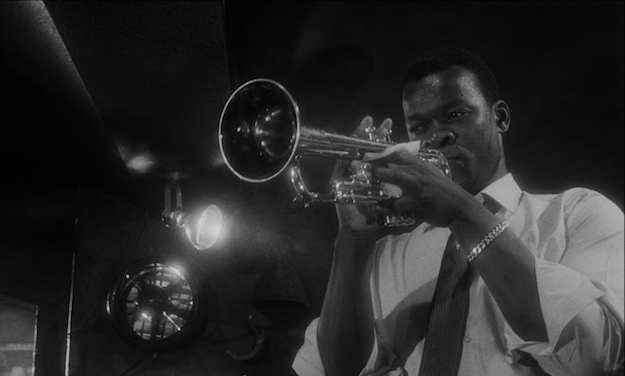 When he first appears, Johnny gives the impression of being a token happy black friend for Jane, who plays jazz and has helpful advice for how to catch bedbugs, but both Forbes's script and Peters's performance give Johnny plenty of shading and more than a little ambiguity. When Jane and Toby's romance looks more and more inevitable, Johnny strongly voices his objections on moral grounds. But is it really morality, or is Johnny just jealous? And if he's jealous, is it of Toby or Jane? There are a number of excellent character actors peopling the world of the boarding house, with Avis Bunnage as the scheming harridan of a landlady, Patricia Phoenix (who appeared for over two decades on the British soap Coronation Street) as a world-weary prostitute who does business out of the building's basement, and Cicely Courtneidge as a snoopy old cat lady who once was a vaudeville star but now lives the life of a solitary bachelor. Bernard Lee, best known for playing M in the first 11 James Bond movies, pops up as a jolly cockney customer of Phoenix's lady of the night. Caron's character finds genuine friendship in the world of her rundown apartment building, and the kindness and honesty of those relationships makes The L-Shaped Room far more resonant than the fashionable trappings of its subject matter. Tom Bell's angry young man -- through no fault of the actor's convincingly forceful and impassioned performance -- stands out particularly as a relic; for a man in his late 20s, Toby has the emotional intelligence of a junior high school kid. To its credit, the film acknowledges that the character has some growing to do, and its open-ended conclusion offers a sliver of hope that he will. The L-Shaped Room comes in a limited edition of 3000 copies. The disc comes with a booklet featuring a liner notes essay by Twilight Time's Julie Kirgo. Another first-rate remaster provided to Twilight Time by Sony. This AVC-encoded 1080p 1.66:1 transfer features excellent depth and clarity and a satisfyingly filmic look, with well-resolved film grain. Rich blacks, nuanced contrasts. Everything you would want from an HD re-do. Fairly unassuming, but this DTS-HD MA 2.0 mono mix is clean and clear. Dialogue is understandable, and it's mostly a dialogue-driven film. Some music cues lifted from Brahms that sound suitably full. An English SDH track is provided as the sole subtitle option. Audio Commentary by Nick Redman, Julie Kirgo, and Lem Dobbs - Another delightful in-house track recorded by the Twilight Time crew. Redman and Dobbs spend a lot of time reminiscing about London when they were kids and commenting upon how much it has changed, while also providing anecdotes about their real-life run-ins with members of the cast and crew. As always, it's a casual discussion that blends history with gossip. There's also some idle speculation about the origins of English slang ("kip," by the way, comes from an old term for brothels and "Blighty" comes from the Hindi word for Englishmen). When it was released in the early '60s, The L-Shaped Room was sold for its "adult" subject matter. Its story is no longer outrageous, but the film's performances retain their compassion and honesty. Highly Recommended.